At one point in yesterday's trading session, the Nasdaq Composite was down over 1%, however it bullishly reversed off its days lows and ended the session with a slight loss of 0.11% - volume was far above average (Point A). The Nasdaq Composite dropped 1.51% and volume was far above average indicating institutional selling (Point A). 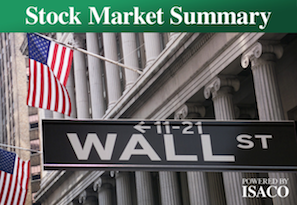 The Nasdaq Composite bearishly reversed and closed with the day with a -0.01% loss. Volume was far above average possibly indicating churning (Point A). The Nasdaq Composite lost -0.36% and volume was above average indicating institutional selling (Point A). The Nasdaq Composite lost -0.02% and volume was far above average (Point A). The Nasdaq Composite gained 0.15%, volume was far above average indicating possible churning (Point A).